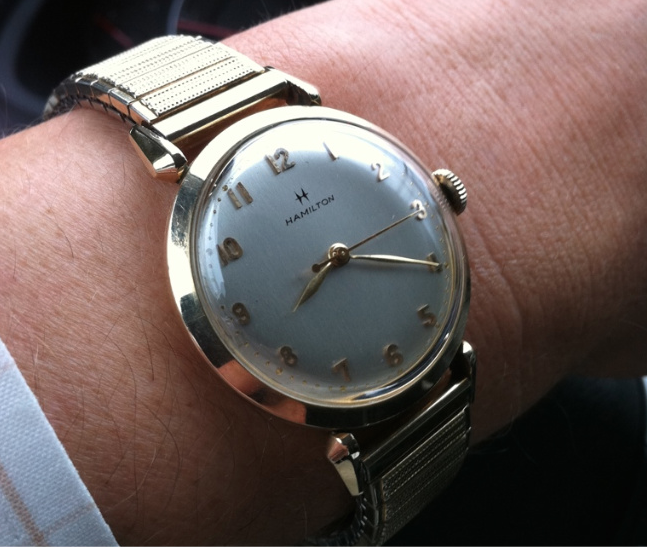 In 1953 Hamilton introduced one of the most prolific and popular models of it's modern lineup - and possibly of all time. The Rodney was introduced in 1953 and ran through 1964. 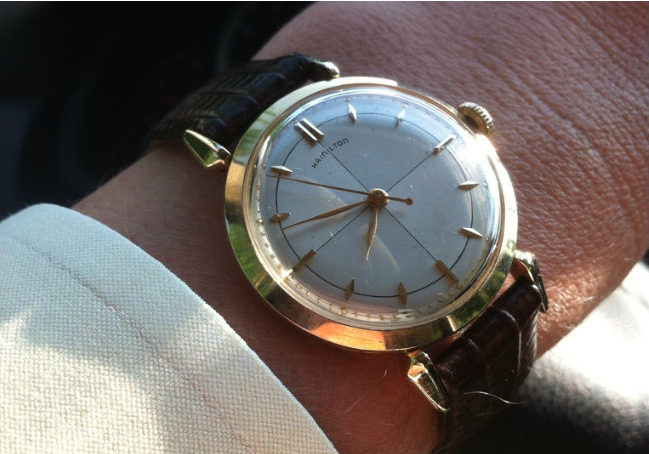 It came in several different dial arrangements and even came as a left handed model with the crown on the left side next to the 9. It was a popular "presentation watch" and is often found with anniversary engravings from loyal employers to loyal employees. Over the 11 year period several 18 Jewel, 8/0 sized movements were used, starting with the 748, then the 735 and even 736 movements. The latter two are evolutions of the 748 design and incorporate enhancements related to the balance design and inclusion of "shock jewels". The Rodney is a nice sized watch, large for it's time and very wearable by today's standards. Dial options evolved with time as well. Four typical dials can be found. First is a four quadrant, two-toned marker dial with pearlized dots at the minute track (perhaps most common), then there is an Applied Gold Numeral dial with numbered second track, later designs offered another AGN dial with pearlized dots, and finally a dial with gold Masonic symbols. No Hamilton collection is complete without at least one Rodney in the stable. One thing to keep in mind with Rodneys - especially the AGN version, is it looks very similar to the earlier Secometer B. It's often misidentified if you go just off of a catalog image. The Secometer B ran from 1948 to 1952 and also used a 748 movement with an AGN dial. The case looks just like a Rodney - except it's much smaller when compared side by side. 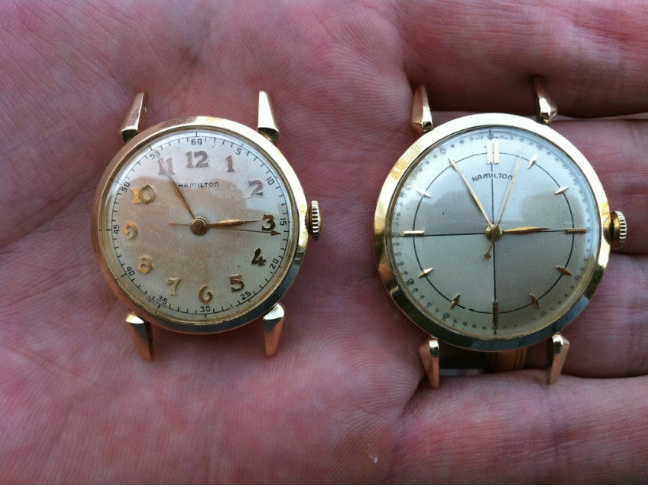 Getting dials refinished is a common practice, and done right it can do a lot to improve the look (and value) of a vintage watch. Rodney dials with pearlized dots are tricky to refinish and often the refinisher leaves empty holes as shown in the photo directly above. 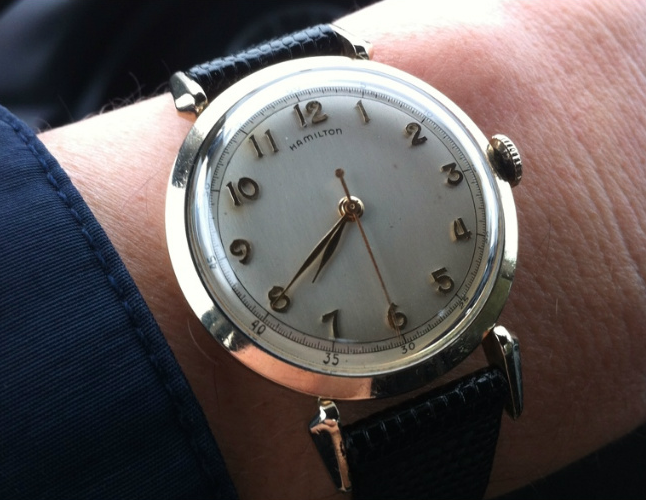 There's a lot of debate among Hamilton enthusiasts regarding whether or not these dials can be properly refinished. Are the dots removed during the refinishing or just not properly colored in afterward? My personal opinion is the dots are holes specially end-milled into the dial and have a gold enamel droplet in them to make them look like they are "on" the dial - but they're really "in" the dial. The dial above can be "fixed" by very carefully re-adding a drop of gold enamel to each hole. How hard can that be - there's only 60 of them! So what band did the Rodney come with when it says "bracelet"? I always seem to see the leather or replacement bands but never a good picture of a full original "bracelet" band. Anyone know the part number or how to search for a replacement stem for the 748 Rodney? The 747 and 748 (et al) share the same stem. They are 8/0 sized movements. If you look in a parts manual they are easily identified. However, you can call any parts house and tell them what you want and they will identify it for you. Here's a link to a parts manual. What was the purpose behind naming the watch "Rodney", was there a person in mind with that name? Same question about the Hamilton "Boyd". I bought one for $167.59 here in México in a web page, is a good price? It's one like the first photo. It's in original state (without restoring). That's an okay price if it's in good shape. I like the Rodney, it's a sharp watch and a good size.